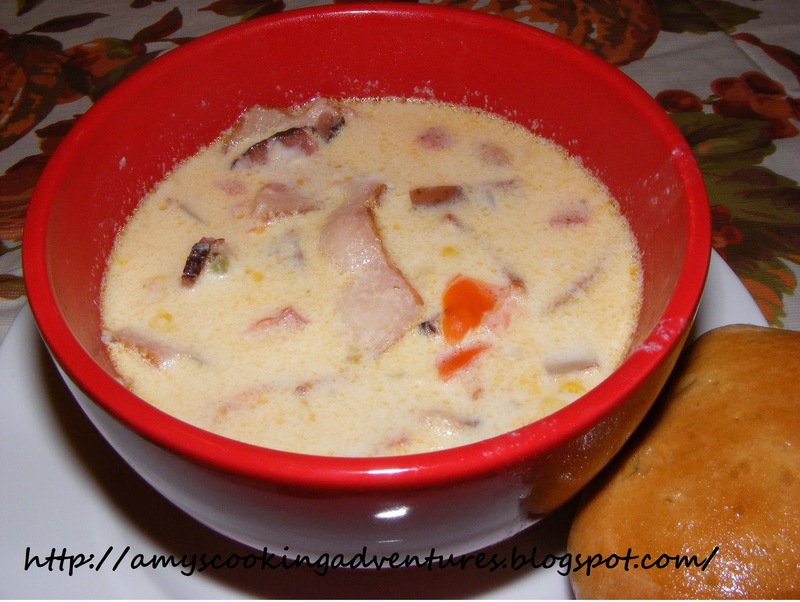 Don't miss an updated version of this recipe, found here! It’s another cold, blustery, school starts late because it’s so gross out kind of day. This also makes it a fuzzy sweater and warm bowl of soup kind of day. 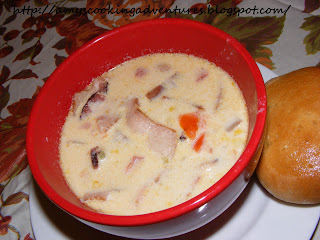 Bacon Corn Chowder is one of my all time favorite soups (I like it on rainy days in the summer, too). I have experimented some with this recipe by using frozen or canned corn in place of the corn cut off the cobs (because cutting corn off the cobs is very time consuming). I can honestly say the using corn off the cob is well worth the effort. Corn on the cob (even the frozen cobs you find in the freezer section at the grocery store – just be sure to defrost them first) had a certain sweetness that frozen and canned kernels lack. This sweetness, paired with the spicy jalapeno is what makes this soup great. That and bacon. Bacon makes everything great. Bacon Corn Chowder is fabulous served with a meat and cheese tray or with “Texas Roadhouse” Sweet Yeast Rolls. So pull up a bowl and get toasty! Cut kernels from corncobs (about 3 cups), reserving 3 cobs. Discard remain cobs. In a soup pot, cook bacon over medium heat until browned. Transfer bacon to a paper towel lined plate to drain. When cool enough to handle, crumble bacon pieces. Add onion and jalapeno to bacon drippings in soup pot (I usually drain off some of the drippings if there is an excessive amount left over). Stir and cook until onion is tender, about 5 minutes. Add garlic, cook 1 minute longer. Whisk in flour, salt and pepper, cook for 1 additional minute. Stir in potatoes, corncobs, and broth; heat to boiling. Reduce heat, cover, and simmer until potatoes are tender; 10-15 minutes. Discard corncobs from soup pot. Stir in corn kernels, cooked bacon, tomato, and half and half. Heat through. Serve immediately.